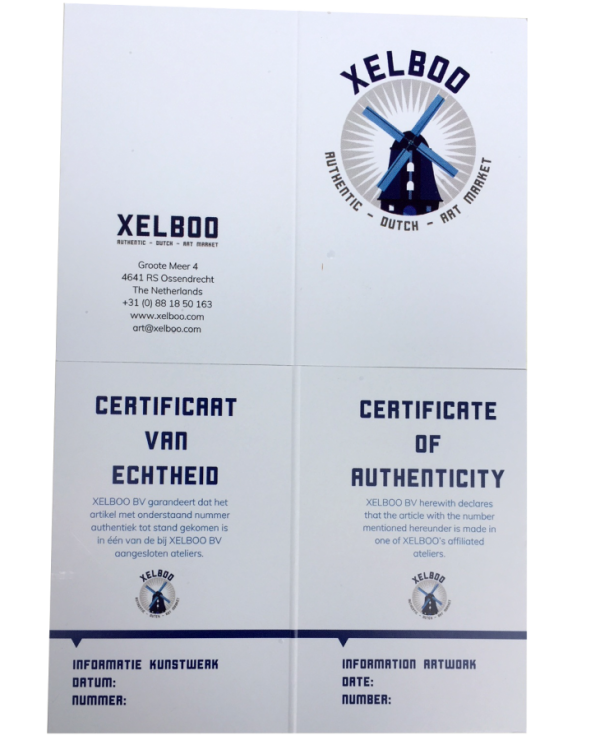 Xelboo selects authentic Dutch handmade art for you. Artists that we work with have a strong connection with Dutch culture. Some of our suppliers have been around for literally hundreds of years! Expect only high-quality art pieces from our shop. Because the art we sell is made by hand, pieces can cosmetically deviate from another. Our artists will always try to make the product look just like the image on our website. Every piece of art comes with a certificate of authenticity. When an order is placed, we prepare your art piece and package it with great care. We will provide you with a track & trace number so you can keep track of your art piece. Every piece of art you can buy in our shop has a certificate of authenticity. The certificate contains information on your purchase, date of purchase, artist information etc. Each certificate is accompanied by a unique certificate number. Every piece of art that we sell is guaranteed handmade in Holland. Exceptions are pieces of art produced in a small series. Art in these series can possibly be imprinted with giclée or screen printing techniques. The foundation of the series are however always handmade in Holland and the techniques mentioned above also require a lot of hand labour. Please check the product description to see if a piece of art is handmade with the above techniques. Overall, a certificate of authenticity guarantees that you have bought an original Dutch piece of art. All of our art pieces are packed and sent with great care. Depending on the sort of art piece, we select the most secure packaging and shipping company. Most of our products are sent with DHL, the biggest and most reliable shipping company in western Europe. You will always receive a track & trace number that enables you to follow your shipment from door to door. Prior to sending the art piece we consult our logistic partner and give you an estimated delivery date. Overall we want you to be able to prepare for your art piece without worrying. You can usually count on 5 – 10 business day delivery time.